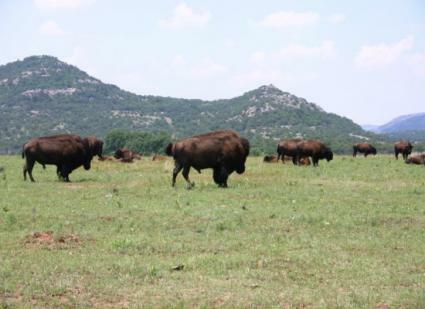 The Wichita Mountains Wildlife Refuge hiking opportunities are near Lawton, Oklahoma (twenty-five miles away). When you get there, you'll see that the area has everything the old Wild West had to offer. It's left relatively unchanged compared to the rest of the landscape, and stands as a reminder of the past as well as a symbol for wildlife preservation.If you do decide to choose the Wichita area for your next hiking excursion, don't forget to bring your camera. Some visitors go out just to take pictures of the wildlife. Others intend to wander around on foot and see what they may stumble across. Either way, you'll want to take home some evidence of the natural beauty that can still be found in the heart of the United States. Photography's the easiest way to do it. It may not be as exotic as a guided tour through parts of Europe, but if you live in the United States, it can be nice to take a moment (or day, or weekend) and appreciate the natural beauty found within your own country. Again, for US citizens, it's a cheaper way to get a fun hiking trip in. There may not even be any airfare necessary. You get to experience the prairies and learn more about the history that took place there through their educational visitor center. With over 22,400 acres of wildlife, there's always something to see. Before you get started on your hiking adventure, get educated at the visitor's center. Hours are from 10:00 AM to 5:30 PM. The center is closed on Tuesdays and major holidays. You can learn from dioramas, exhibits, fine art, sculptures, taxidermy, and even history and night sounds exhibits. Pick up more information in the form of books, brochures, and maps while you're there. In addition to the educational opportunities, they do have hands-on learning available in the form of camping, hiking, and fishing. If you're more of a doer than a listener when it comes to learning and enjoying a new area, by all means, hit the trails! They don't mind. In fact, they're glad to have you. There are just a few rules to abide by to keep everyone safe-including the wildlife. Doris Campground: This is the most luxurious of your camping options because it's equipped with water, grills, restrooms, showers, tables, and electrical hook-ups. You'll have to pay to use the facilities, but it could be worth it because you get to pack light and only "rough it" a little. This could be ideal for those new to camping. Getting a reservation is wise. Charons Garden Wilderness Area: This one is backcountry camping. Again, for this one, you'll need a permit and a reservation. Only ten parties can camp here at once, and you can only stay for up to two nights and three days, so plan ahead. Hiking: If you want to walk for hours and view wildlife in its natural habitat, there are fifteen miles of hiking trails available for your foot-pounding pleasure. You get a great sampling of the terrain, though, while you're at it. Travel through the forest, across mountains, and even across the prairie. Keep your eyes peeled; you'll be hanging out with wildlife for the extent of your hike. Fishing: If fishing is your ideal way of getting back to nature, you can do that here too. You don't have to walk the fifteen miles of hiking trails to enjoy the wilderness refuge found in Wichita. Catch yourself some largemouth bass, sunfish, crappie, and catfish. Fishing guidelines are more relaxed than you might expect; check with the visitor center for details. Hunting: Yes, even hunting's permitted. However, these privileges are strictly controlled. You'll need to speak with someone at the refuge headquarters to get details on the whens, the wheres, and the hows. There's an application process to get through, so make sure you start early if you're interested. Don't cook or build fires outside the designated areas. Your best bet is to leave your dogs or other pets at home, but if you do have to bring them, they must be on a leash. Leave loud radios and alcoholic beverages at home. Only walk the Wichita Mountains Wildlife Refuge hiking trails when the sun's up.